I found a recent visit to Sister Marold’s room refreshing. 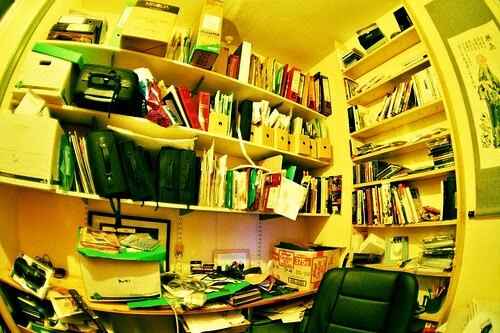 It was simple, aesthetically pleasing, orderly and neat, not bulging with unnecessary stuff. I thought of my overloaded shelves and books stacked up on the floor, my mailbox bulging with catalogues, several messy drawers and the table next to my reading chair with topsy-turvy stacks of stuff. Do I need it all? Do I need even more stuff? Could I scale down, recycle, share some things with those who need them more than I do, put more limits on the stuff I accumulate? I think so! For Americans, making do with less stuff is a radical shift away from a system deliberately geared toward consuming (and trashing!) more and more stuff. “More” stuff, the “right” stuff, “new” stuff is supposed to make us happy and make the world prosper. But does it? I don’t think so. It takes a lot of oil, a non-renewable resource, and a lot of potentially dangerous synthetic chemicals, even untested ones, to make, preserve and transport all this stuff. It takes a lot of unjustifiably cheap labor to make sure we get it at a bargain price. At the rate we are consuming stuff in the United States, we would need three to five planets the size of earth to ensure that everyone could live at our economic level. The people of the world are our family; the earth is our home. Using the Rule of St. Benedict as our guide, we might consider the human family our community and the earth our monastery. Following Benedict’s counsel, we can join others in treating all the goods of our earth-monastery as sacred and ensuring that each human family-community member has what he or she needs. With them we can pray and work for ecologically sound means of harvesting and sustaining earth’s resources and for a more equitable distribution of goods. To learn more about the impact of producing, having and trashing too much stuff, and how we can join others in changing this system check out the 20 minute video, The Story of Stuff, by Annie Leonard, which we've embedded below! This blog is by Katherine Howard, OSB. S. Katherine is a member of the World Justice New Jubilee committee at the monastery and has agreed to contribute a blog on the fifth Thursday of each month related to social justice. These past weeks I have been reading letters in our archives written by the Sisters who went to China in 1930. I did this in preparation for a talk: In Their Own Words: Letters from China 1930-1948. 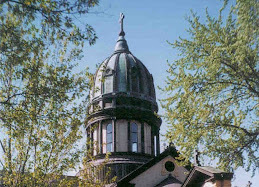 The talk will be in the monastery dining room on Sunday, May 16, at 1:30 p.m. There will be a chance to tour the museum exhibit afterward. I did not expect to find so many letters, nor did I anticipate how much they would touch me. I am very familiar with the story—how the six Sisters ministered in Peking and Kaifeng; how they lived through the Sino-Japanese and World War II; how they were forced out of China by Mao Zedong’s army and eventually settled in Formosa (Taiwan) and Japan. Reading their letters was like accompanying them on their journey. 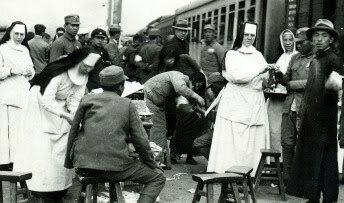 I have written previous blogs (one, two and three) on the current exhibit in our monastery museum: “Mission to China and Taiwan 1930-2010.” In this blog I will share from letters written by Sister Francetta Vetter, superior of the group, between 1937 and 1947—during the Sino-Japanese War; at the end of World War II; after fleeing the communist army. There was no communication during World War II (1941-1945) when the Sisters were in internment camps. It’s after ten p.m. … We have just had supper. [At 3:30] a load of wounded soldiers came through and before the train left another train load was brought in. Over 1300. …Terrible cases. Worse than ever. The sirens send creeps through us, especially when [they] sound the short and long which means close danger. During these times we say our prayers fervently…. I can assure you that the tense feeling is awful, and oh, how grateful we are when at last the "all’s safe" siren gives the signal. Please, dear Mother, do not reproach yourself on not having called us home. We would have been the saddest sisters to leave here when it was most important for us to stay. Peace and greetings! My dears, concentration camp days are over and you cannot adequately understand…how our hearts swelled and our throats choked when we sang the Te Deum on hearing that Peace had come. [The siege on Kaifeng] came without warning….Please pray for us as this is our darkest hour in China. God knows it was hard enough to come to China; then to be forced out by the Japanese and the horrors of that war. ... [T]his is just about all we … can stand. ... Don’t worry about us. God will see us through. We lean on Him. By 1949, half of the missionaries settled in Taiwan, half in Japan. Sister Francetta was among those who helped establish a community of Benedictine Sisters in Japan. Click here for more information and video tours of the exhibit. What Now for the Church? There has been an awful lot of media attention lately on the issue of abuse of children by clergy of the Catholic Church. Catholics are saddened and confused, angry and defensive. What do we say around the water cooler in places of business and education? What do we say in our parishes and families? Perhaps some of the more thoughtful responses in the media are those that ask what we can learn from this episode in the history of our Church at this moment in history, the year of our Lord 2010. How can our responses lead to a renewal in our church, a “new Pentecost”? One: We can continue to implement the Second Vatican council by making “communion/community… being of one heart and one mind” into something very real in our daily lives. But, he writes that “it requires dialogue and perhaps painful change. It means mutuality in communication and decision making.” I believe this requirement is true in families, in the parish, in communities, corporations and academic institutions. I find these three suggestions inspiring and doable, whether one is in the monastery or not. I find these to be the work of Christians, whether in the Roman Catholic Church or not. In addition, my own personal joy in our Church today is found in (among others) three places: the vibrant parishes across the country that continue to seek the kingdom of God and God’s justice and who manifest that in their worship and service to their most needy neighbors; in families who continue to pass on these values to their children; and lastly, in communities of women religious in this country who have in season and out of season dedicated their lives to the mission of Jesus Christ on this earth. 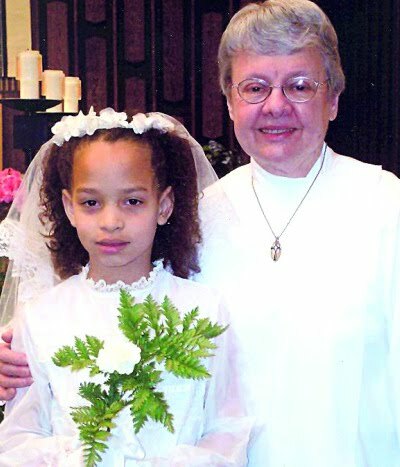 photo: S. Kathleen Rademacher with a First Communion candidate at Presentation of the Blessed Virgin Mary Church in Maplewood, Minn. The quotation in the title above is from Psalm 34 but it is also quoted in the Prologue of the Rule of Benedict. Oblates of Saint Benedict respond "I do" to the psalmist's question. What are Oblates. 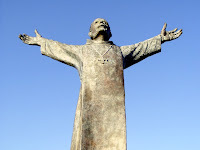 Oblates are Christian women and men who are called to live their baptismal vocation by following the Rule of Benedict in their lives outside the monastery. Being an oblate is about following a spiritual path and being on a journey of seeking God along with others who are traveling the same path in order that "Christ may bring us all together to everlasting life" (Rule, 72). Working with the oblates of our monastery for almost 8 years I have learned many things. Some people who seek to begin the oblate journey tell me that they read the Rule of Benedict for a course, some have gone to a Benedictine school or college, some yearn for a deeper relationship with Christ and they are looking for others who desire the same thing. 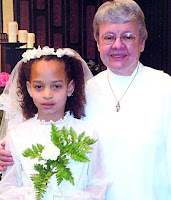 Others have spent time in our Studium program here at Saint Benedict's, they have participated in our liturgies and have gotten to know some of our Sisters. As the time of their departure approaches they know they want, they need to remain connected with us and so they ask to begin the oblate journey. Concretely, what might the life of the oblate of Saint Benedict look like? They live the gospel by practicing lectio divina so that their hearts are transformed, and by serving the people of God. Oblates read, study and integrate the Rule of Benedict. They associate themselves with a monastery and attend oblate days or other events at the monastery. Oblates do not pay dues but they might be donors of the monastery or give a free-will offering when they attend oblate days. They read books on Benedictine spirituality either with a group which meets monthly or on their own if they cannot join a group. Finally, the monastery to which they are affiliated is their spiritual home so that they become more than guests, they are members of the extended family of the monastery. The quotation above is from Psalm 34 but it is also quoted in the Rule of Benedict which Oblates, along with the Gospels, promise to follow when they make their final commitment. What and who are Oblates? The standard answer goes like this: Oblates are Christian women and men who choose to seek God as oblates of Saint Benedict. They fulfill their baptismal vocation by intentionally doing so through developing a Benedictine heart. Today is an unusually balmy April day. It’s the kind of day one waits for all through January and February. The budding trees remind me of the new life that incubated all winter in the roots of the old tree outside my friend’s window. But right now I’m focusing only on the face of my long time friend. Time is standing still for her and for me. I watch her as she takes one breath after the other. The evenness of her breathing lets me know that she is temporarily comfortable. She knows she is dying of an aggressive cancer. She acknowledges that the rapidness with which it has overtaken her life and the blurring effect of her pain medications periodically places her in an in-between world. However, as each person enters her room, she immediately becomes attentive to them and tries to enter their world. This pattern of attentiveness to those around her is so well developed that even her diminishment can’t prevent her from this seasoned response to others. Her smile is warm, gentle and completely welcoming. As I let tears fall, I’m reminded of how she has been a message of hope to so many of her friends over the years. Her listening and nonjudgmental presence always created space for people to be their most authentic self. Her quick wit, lively insights and love for investigation always provided many animated conversations and delights. Even as I watch her today, she incarnates an Easter message for me. She reminds me of the words of Demetrius Dumm, OSB, as he quotes Sacred Scripture, “Very truly, I tell you, whoever keeps my word will never see death”. His commentary says, “This does not mean that we will not die. Rather, it assures us that, if we live unselfishly and try to be a loving presence in our world, we will acquire a new life that cannot be touched at all by physical death”. Her loving presence has survived many winter incubations. She is on the edge of her Easter budding. The tears of her friends are the grateful moisture that accompanies this budding. Her unselfishness has strengthened our roots for our own Easter journey. We are confident that her Easter presence will continue to accompany us in the days ahead. It has broken through ignorance and opened our world to cultural exploration. Ways of communicating and naming “friends” is growing at a rapid pace. The inbox on my computer is saturated with the great breadth and depth of human concern, need, inspiration, friendship and humor. I barely escape a day without logging on to the computer and responding to and navigating through fields of interest. Today my routine was brought to a halt. As usual I came to my office and pushed the power botton to on, only to hear a piercing shrieking sound coming from my computer. I thought, this can’t be so, of course I tried pushing the button one more time only to be met with the same penetrating sound and no sign of life coming from the computer. This is when I had to be mindfully aware so that I would not lose myself in gasping breaths that would have me hyperventalating. There was an immediate restlessness that settled on my psyche. What was I to do this day? How could I be productive without my computer? I was certain that I was disappointing so very many people because I wasn’t able to give immediate responses to their questions. I felt as though my hands were tied, my voice was silenced and my longing to explore was locked by a void. It was only when I became aware of a paralysis setting in that I knew I was off balance. Since when did immediacy equal genuine care? Had I surrendered my senses to a machine? Spring is bursting with life and I need only take myself outside to breathe in the freshness of the air; to see the lacey green canopy that hovers over the walkways; to touch the earth and feel its birthing; to hear the birds singing their songs perched on the highest branch and daring me to see from which branch the songs are being sung. Yes, I need only to take myself into this Spring day to meet the stranger with a fresh greeting of friendship and to chat, if only for a while, about the beauty of this day. While I am grateful for this reminder of lavish blessing in relating face-to-face, I cannot deny I am thankful that my computer is now repaired. I pray I do not become consumed by its lure. 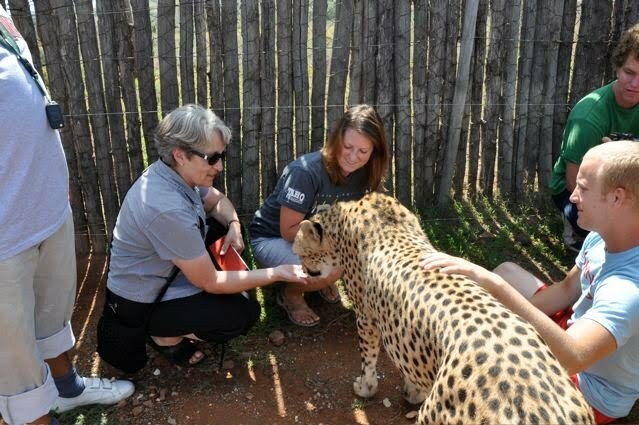 Are There Wild Animals in South Africa? Greetings from South Africa! From seeing a dassie (rock rabbit) sunning on a boulder at the top of Table Mountain to spotting dozens of kudu (type of antelope) while driving along Route 75 towards Graaff-Reinet, it appears wildlife is still plentiful in South Africa. In order to protect and preserve these great national treasures, nature reserves, national parks and game reserves have been in place long enough so that the long-term effects can already be seen and felt. At Addo Elephant Park, we were fortunate enough to find at least 150 elephants at the largest watering hole. It was beastly hot, driving the elephant communities to the water. It was a magnificent sight to behold and a pleasure to realize that the infrastructure is in place to assure the existence of the elephantus Africana. On our drive to farms in the Winterberge Mountain region of the Eastern Cape, we not only saw an abundance of antelope, ostrich and blesbok grazing in the open fields, but we also drove in the mountain pastures to spot zebra, wildebeest and warthogs freely roaming the ranges alongside merino sheep and cattle raised by these Afrikaner farmers. Of course, when one is lucky enough to come across dung beetle rolling dung as food for their larvae, the only choice is to stoop down to watch the reverse action of the beetle. In the Karoo, near Graaff-Reinet, while at the top of the Valley of Desolation, vervet monkeys and baboons showed themselves climbing and chasing one another among the amazing rock formations and ledges of this geological phenomenon situated in the Camdeboo National Park. It is a great natural wonder formed millions of years ago by weathering and erosion. We were delighted to pet and even hold cheetah, seval cats and baby lions at the Daniell’s Cheetah Breeding Farm. Daniell Cheetah Breeding Project was started in 2001 to help in the conservation of Cheetahs, as well as to educate people to the importance of conserving this amazing species. Cheetahs can reach 45 miles per hour within 2.5 seconds. Near Port Elizabeth, SAMREC (SA Marine Rehabilitation and Education Centre) rescues and rehabilitates penguins from oil spills and varoius injuries. SAMREC cares for all the sick and injured marine life of Algoa Bay. When we visited they had an Egyptian goose in residence, along with cormorants and oyster catchers keeping the 5 or 6 penguins company until they can be released. Recently, my brother Don was reminding me how lucky we monastics are not to have to worry about car payments, insurance payments, income tax payments, etc. His comments made me ponder again how it is that the vows we take both bring us great benefits and also responsibilities and challenges. We have made vows to follow the monastic way. Thus, we have promised to remain single—not to have a family of our own (chastity). The monastic way means we have pooled all our resources and pledged not to build up finances of our own and to live simply (poverty). We have given up following a career of our own in order to make ourselves available for the particular needs of community life and to be able respond to the ways our community leadership asks us to help support the community. The reason we have given ourselves over to all the demands of our vows is so that we are more free to focus our attention on our search for God while living within the monastic community. The constant challenge for me is to keep remembering why I have given up marriage, family, my own finances and a career. I have given up these pleasures and also these burdens in order to have more opportunity to give undivided attention to seeking God in a committed, communal life. Living my vowed life faithfully may also provide a clarifying principle for others. I believe the benefits of living this vowed life go beyond just those of us who are monastics. Those living in the world in the midst of all the complexities that are a part of that life are also busy keeping a focus on what life is really about. I believe they watch me and my Sisters who have sold everything to possess the pearl of great price. They look to us for a joyful testimony that there indeed is a pearl of great price. 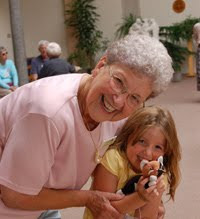 photo: Sister Linda Kulzer with a young friend at the annual Donor Appreciation Day celebration at the monastery. Today is Holy Thursday in the Roman Catholic Church. The old English term “Maundy Thursday” is not used much anymore and I never considered its source. However, this old historian couldn’t resist doing some research into its meaning. 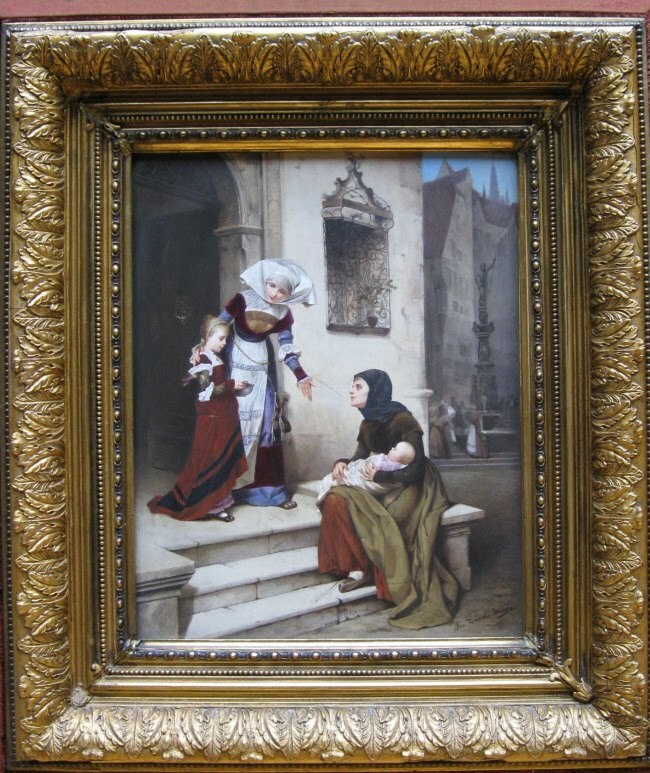 The English word “maund” refers to a small basket held out by beggars. Thus, the term Maundy Thursday is thought to arise from a medieval custom wherein alms were given to the poor on that day. Most of us, however, equate Holy Thursday mainly with the Last Supper of Christ and his Apostles. Some of that celebration or service is given to the washing of the feet and the collection of food baskets for the poor. I find these rituals or customs impressive and very moving -- as concrete expressions of Christ’s love, carried out for and by his followers. Here in Sacred Heart Chapel we have been washing the feet and collecting food for at least 20 years. Historically, English monarchs had the custom of washing the feet of 12 poor people and giving alms to the poor on Holy (or Maundy) Thursday. There is even a sketch of Queen Elizabeth I, drawn in the 16th century, washing people’s feet. English monarchs ceased this particular custom by the 18th century, though the giving of alms continues. And, recently I learned that there is a connection between Dante’s Divine Comedy and the Easter Triduum. The section of The Divine Comedy titled “The Inferno” describes Dante’s journey through hell which begins on Holy Thursday night and continues to the dawn of Easter Sunday when he emerges from hell. Symbolically, this is a period of “death” for Dante, when he suffers but also rises from the darkness of sin into the glory of resurrected life. In New York City, the Cathedral Church of Saint John the Divine presents an annual reading of key selections from “The Inferno.” This occurs every Maundy Thursday evening and over 20 people serve as readers. While I don’t intend to read “The Inferno” this Holy Thursday, I shall keep these historical references in mind as our community gathers to recall Christ’s Last Supper and reaches out to the needy in spirit and in body. photo: This painting on porcelain, "Charity," by 19th century Austrian artist Josef Zasche, was donated to the monastery by Connie (Grell) Schutta in December 2009.